FlutterbyeFaery Designs: New CU Products! I have 2 new products available at BrownieScraps! 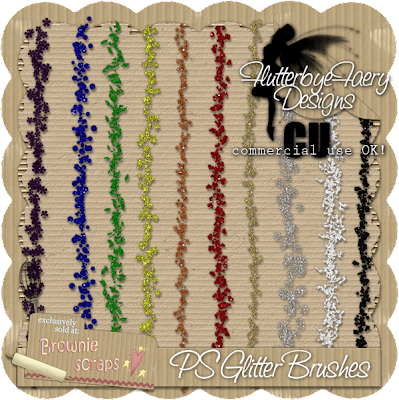 It's glitter brushes in 10 different shapes with 10 different colors of glitter to go with them! And it's available for PSP users too! Not just Photoshop users, although there is a Photoshop version also. Glitter shapes include square, round, flower, foot, star, moon, sun, leaf, snowflake, and heart. Glitter colors include black, white, silver, gold, red, orange, yellow, green, blue, and purple. 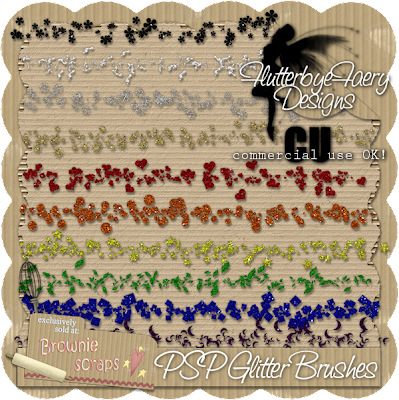 PSP version includes brush files & glitter seamless tiles. Photoshop version includes brush file & glitter layer styles. On sale through Sunday for 25% off!